Most of the time woodwork involves straight lines and getting things square. 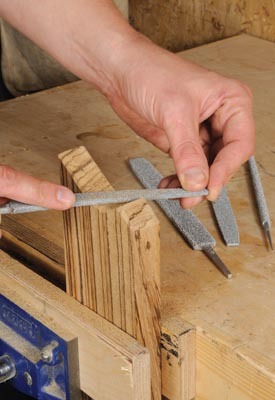 But what if you want to give something an awkward shape, such as rounding the corners of tenons? Here's a rundown of tools available. 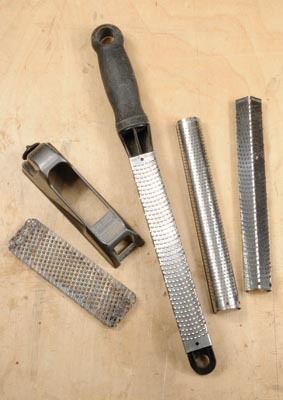 Woodfiles and rasps are the traditional way of shaping. Rasps are quite coarse and can tear the wood fibres so are used only for the initial shaping. If you can find one, a hand cut swiss musical instrument rasp used for shaping violins has much finer teeth and still cuts incredibly well. 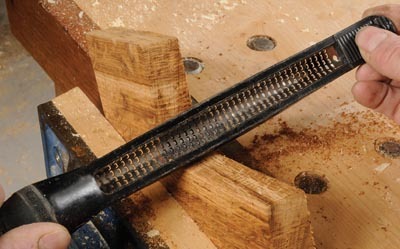 A woodfile is similar to a coarse metal file with a large tooth grating, enabling it to do relatively fine work on wood after the rasp, but still requiring abrasive paper afterwards to give a finished surface. In my youth, the surform shaping system was popular, and it still should be. The hardened steel blades have sharpened teeth punched in them. They come as a shaper, planes or files, including a round one. The standard tooth ones are a bit of a rough ride and need care to control them; the fine blades are better. However nowadays, there is competition from the Microplane tools. These also have sharpened teeth which are punched in much thinner steel, giving a much more razor-like cut. Available in coarse and fine blades and in several different sizes, profiles and handles: these have to tried to be believed. An even more recent innovation is the Kutzall system. 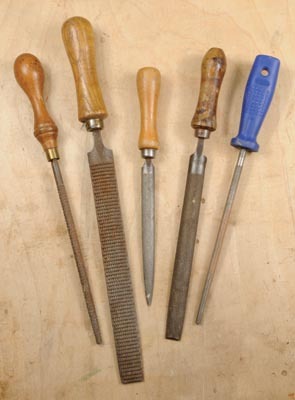 Kutzall are available both as files and rotary shaping tools. They have strange fine nodular or granular deposits on the blades, and a very effective but controllable 'bite' when used. Well worth trying out. And, because the teeth have a random orientation, the file cuts in any direction. Once you find shaping tools that suit your needs, the results can be satisfying and give you the urge to do shaping, possibly even some carving!